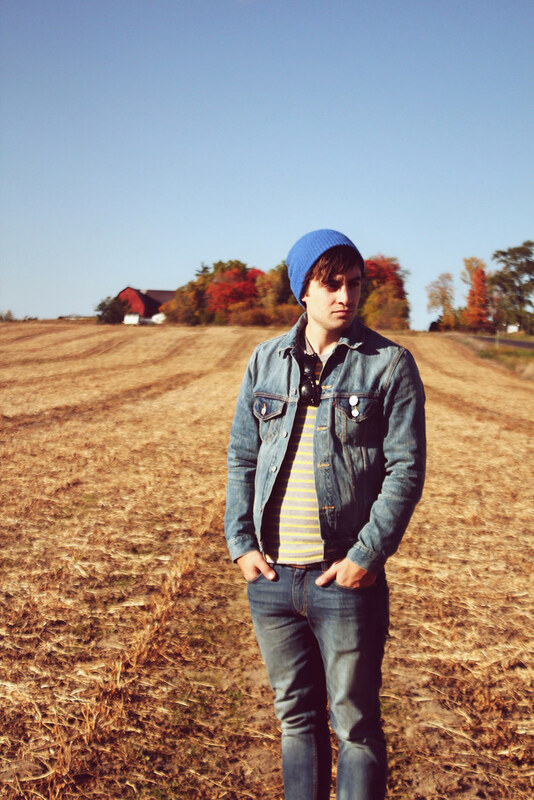 Last weekend, Eric and I headed north to the Fruitridge Farm. 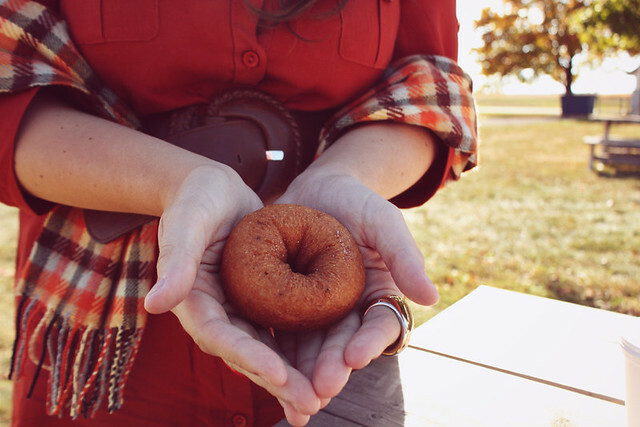 They have hayrides, pumpkins, a corn maze, the best apple harvest donuts and a little park to eat and play. 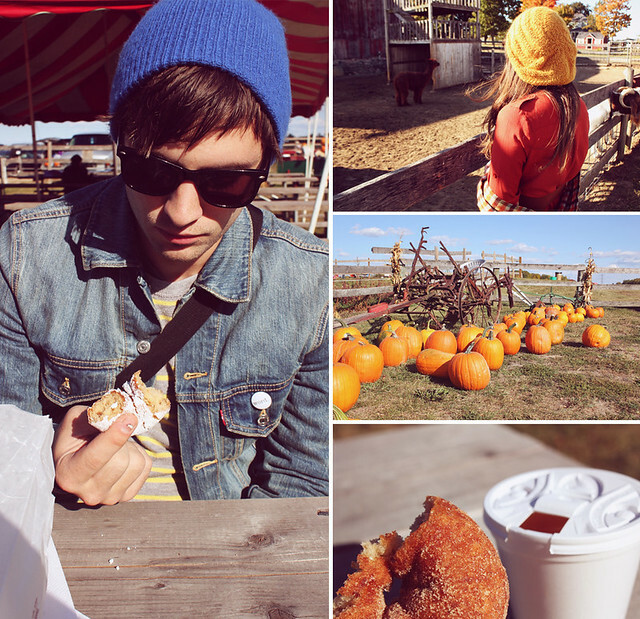 We grabbed some cider and donuts, checked out some of the farm animals and bought tickets for the hayride. When we realized we were the only ones standing in line, we decided to come back another day when it was a bit busier. Hehe! It was fun though. 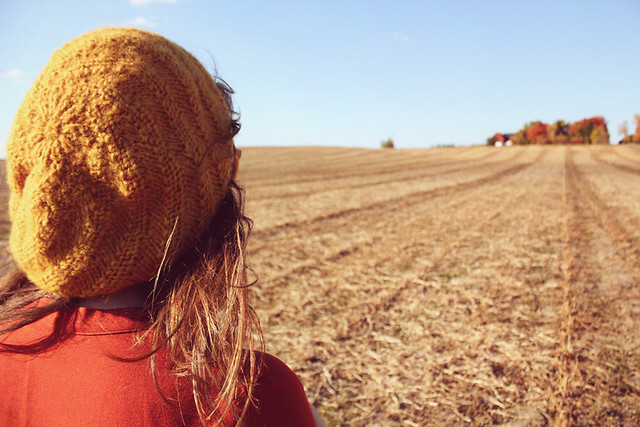 I just love autumn so much and taking it all in. We are so close to peak right now with the autumn colors. It's just insane. I'm in love whenever we're driving anywhere along a back country road. I absolutely loved styling up this dress from my dear friend, Eleanor from Bonjour Bbydoll. 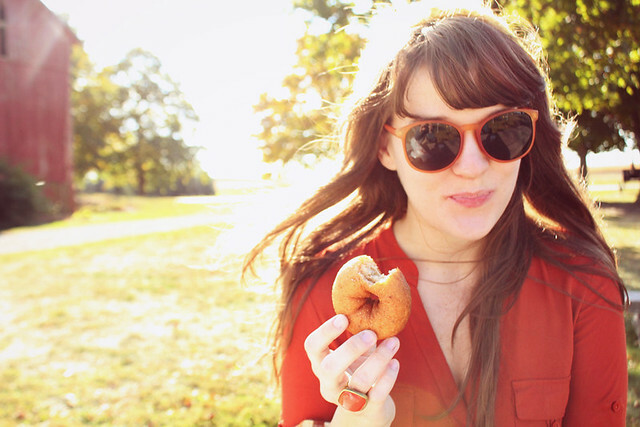 If you don't know about our swaps yet, Eleanor is my stylish blogger friend from New Zealand. When it's autumn here, it's spring on her side of the world... so we're constantly doing seasonal swaps! 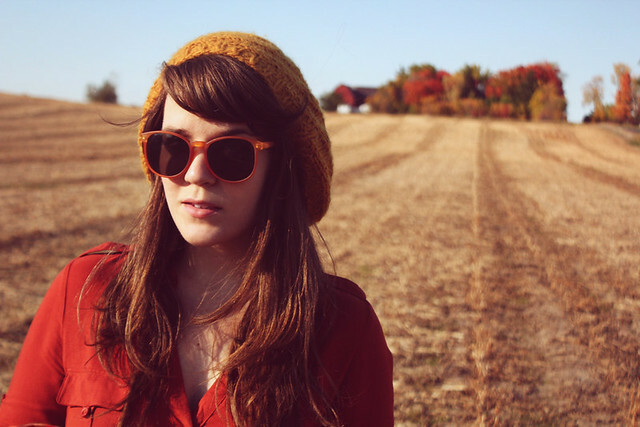 She sent over some of her favorite autumn items and I sent her some cute, floral-y spring items. I loved this burnt orange dress on her, so I had to try it for myself. It was so cute and casual, but definitely a tad on the shorter side! I think next time I style this, I'll pull out my trusty tights. 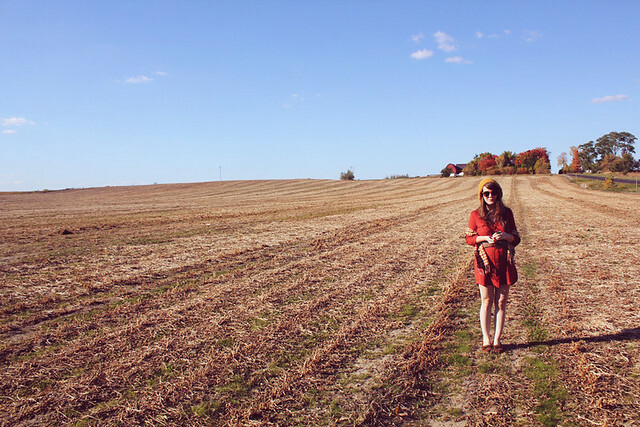 I knocked a bunch of stuff off my autumn bucket list after this day trip. Then, Eric and I headed back and watched Paranormal Activity 2. So I also knocked "watch scary movie" off the list. I love October so much... especially the closer we get to Halloween. It's just the best time of the year. I have so many plans! 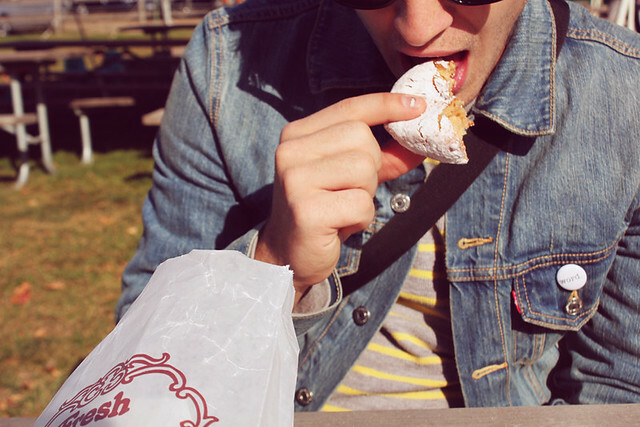 And one of them is to go back here and buy another dozen of these donuts. Mmm, so amazing. And to watch ABC Family's 13 Nights of Halloween. Mmhmm. Now I just need to figure out what to dress up for on Halloween. 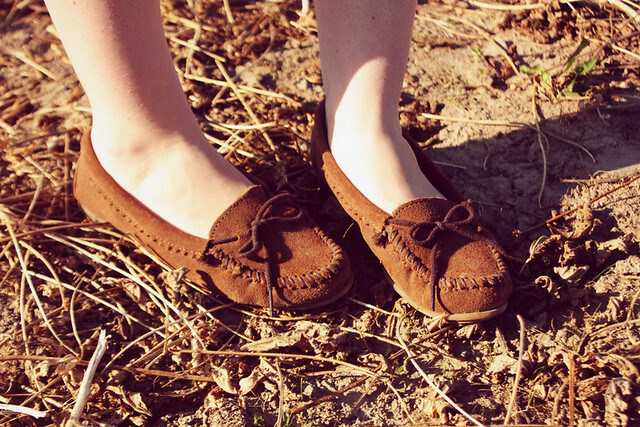 I'm collaborating with Minnetonka Moccasins and styling up three of their super cute moccasins! I'm constantly wearing these skimmers. They are just so practical and go with every autumn outfit I have planned. I'll have a couple more outfits coming soon featuring them, so stay tuned. I also have big news to tell you guys about... hopefully tomorrow or Monday. Weee! Have a great Friday - and I'll see you all soon!